Enjoy protected AAC Music on any device, - anywhere! Easily Remove DRM protected from Purchased AAC music. 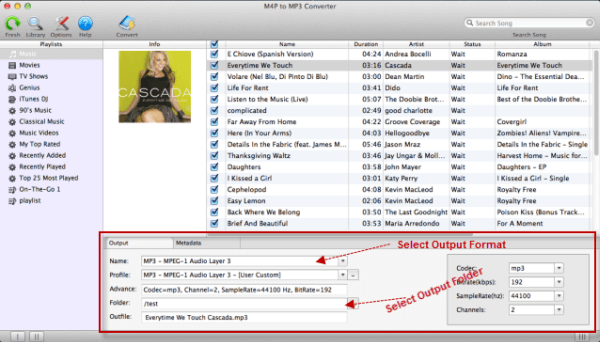 How to Convert Purchased AAC to MP3 on Mac? As we all know, generally you have to buy songs if you want to have them in your PC or other devices. And since Apple developed iTunes and it does provide users with great convenience in buying songs, more and more people prefer iTunes to buy and play music on their computers. Some of the songs you bought from iTunes Store are AAC format, as it offers higher-quality sound than an MP3 while using the same amount of disk space. But these AAC songs purchased from iTunes Store are protected, they can only be authorized to play on a maximum of 5 computers. Meanwhile, some mobile phones, tablets or other devices may not support AAC format. So you may get into trouble while you are transferring or copying songs. If you want to play your purchased AAC songs on other devices without limitation, what you need is audio converter software. As the best audio conversion software, DRM Converter for Mac can help you remove DRM from AAC music and output them to the format you need. These converted songs will not be protected by iTunes anymore and this way of conversion is absolutely legal. Then, you can transfer these songs to any device without limitation and enjoy them everywhere. 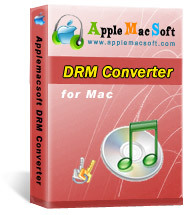 DRM Converter for Mac runs under Mac operating system and it is easy to be used. 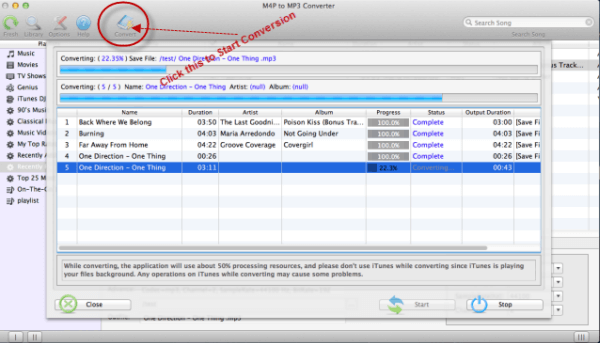 the tutorial below will tell you step-by-step on how you can convert purchased AAC to MP3 with your iTunes. You can convert the purchased AAC songs to MP3 format by yourself with it in following 3 steps. Please download and install the app on you Mac computer, then run it and you will find that all your iTunes files is launched automatically. These files will shown in categories. Then please click "music” and choose the songs you want to convert in the iTunes playlist. Then in the bottom of the main interface, you have to choose MP3 as the output format. And you can also choose the folder for saving output MP3 audio. The profile settings will be adjusted automatically according to the chosen output format. You can also set your own output parameters. Step 3: Start Converting AAC to MP3. After setting all options, please click the “Convert” button, then the program will start to convert purchased AAC songs to MP3 format. It may take some time due to the quantity and the size of the songs. When it is completed, you will see the converted MP3 songs in the folders you chose before. Now, your purchased AAC songs have converted to MP3 files, you're able to play on your Smart phone, Android, music players freely without any restriction. Enjoy it! The best way is to download the demo and experience it for yourself. 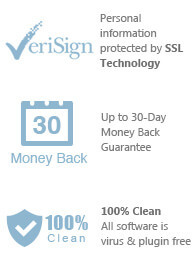 The demo includes all program's features. You can immediately download the very last version of DRM Converter from our website and start to trial it right now !